I consider myself “team pie” when I think about it. . . but I never seem to bake pies. 😛 Is there a single pie on this site? I don’t think so. Cake, though. I’ve made some cakes: Pineapple Dreams Coconut Cake, Easy Chocolate Strawberry Cake, Chocolate Gingerbread Cake, Vegan Heartache Cake and even a Meat Cake! But this cake is very different from all the rest, because it has dairy in it! Yes, milk (as the name of the cake implies). From cows. But! This is a new kind of milk, because let’s talk proteins. Yes, let’s. If you’re cautious about dairy, and have experimented removing it from your diet with good results, the culprit may be protein. Originally, all cows’ milk contained only what is called the A2 protein (beta-casein). However, over the course of time (as farmers migrated herds across Europe and eventually to the U.S., cows adapted to environmental changes, as well as the stress of modern dairy farming and a demand for greater volumes of milk) a new protein variant, A1, emerged throughout global herds, and a percentage of the population in modern society began to experience post-dairy digestive discomfort. Currently, all cows’ milk available in the U.S. is a combination of A2 & A1 types of proteins. Enter a2 Milk®, which has forged partnerships with U.S. family dairy farmers in upstate New York and the Midwest with the mission to continue to expand their “Heirloom Purebred a2™ Herd”. Their farmers are committed to naturally producing milk that is completely without A1 protein. All of their family-owned dairy farms are certified in the humane treatment of animals and their cows are fed a vegetarian, plant-based diet and are never given hormones or rBST. The milk is antibiotic-free with no artificial ingredients or additives. While I personally do not suffer from post-dairy digestive issues, dairy is something I consume infrequently, due to the unsafe, inhumane practices of the conventional dairy industry. The efforts this a2 Milk effort has made to raise the standard of treatment on the farms that they partner with is something that I whole-heartedly support. This milk is widely available (I scored mine at Whole Foods), so go forth and find your nearest location to purchase. Scalded milk produces a moist texture in this simple dessert, an ivory-hued cake that’s so straightforward it’s often referred to, even in vintage cookbooks, as “old-fashioned.” Made right, with a fluffy white crumb and an uncomplicated buttercream frosting, it is tender and egg-rich. Line the bottom of two 6"x2" round pans with parchment and grease the parchment surface and pan sides with oil. Combine the coconut flour, arrowroot flour, coconut sugar, baking soda, and salt in a large mixing bowl. In a small saucepan, gently bring the milk to a simmer. While the milk heats, pulse the eggs, coconut oil, honey and vanilla extract in a blender until frothy. Add the blender wet ingredients and the scalded milk to the dry ingredients, mix gently but thoroughly. Portion the batter into each cake pan and bake at 350F for 25-30 minutes until an inserted toothpick comes out clean. Once the cakes have cooled, remove them from the pans and trim the top and sides to make even and tidy if desired. Frost the tops and sides with a butter knife or specialty frosting spreader. Adjust one cake on top of the other, smooth frosting over the gap. 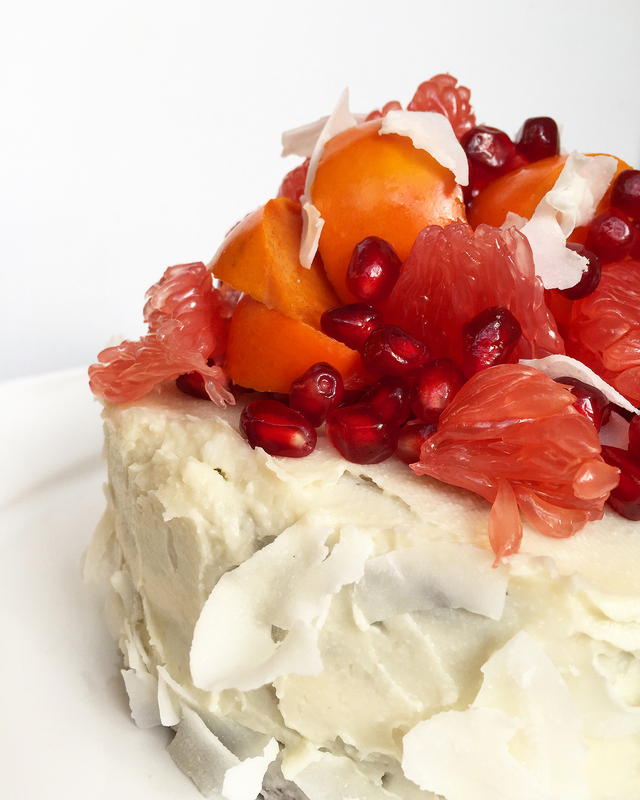 Adhere shredded coconut to the sides of the cake if desired, and top with winter fruit and more shredded coconut. My grandson is lactose intolerant. 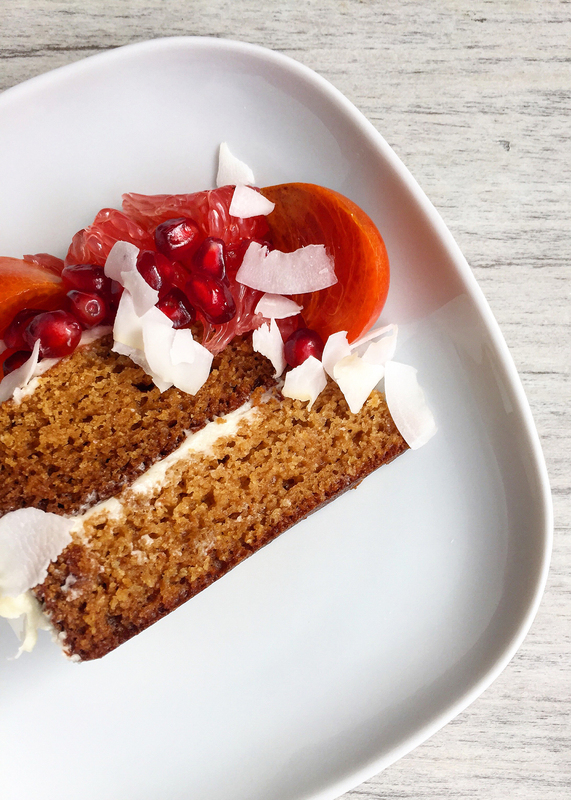 Can I use almond or coconut milk for this cake? Yes, but do not scald the milk. Simply mix it in with the rest of the wet ingredients. This sounds sooo good!!!! I have never had a hot milk cake! I know, right? Thought the concept sounded super cute, though. OH MY GOSH milk cake?! Never heard of it BUT it sounds (and looks amazing). That frosting. I want to lick it off that entire cake!! 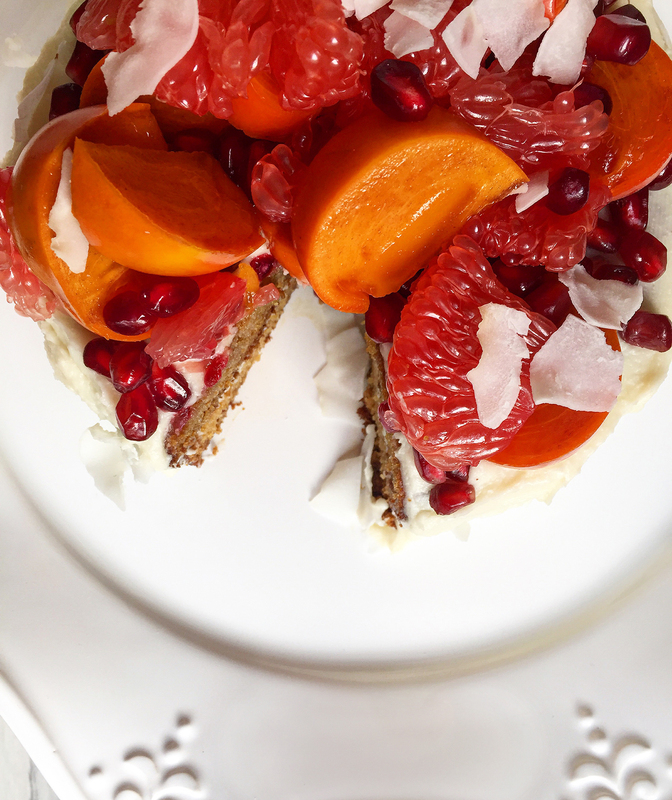 Grain-free baking is a whole other world… thanks! This cake looks delicious. It would be perfect for the holidays. Wow this cake sounds fantastic! Is a2 milk suitable for someone with mild lactose intolerant? I am curious and would like to give it a try. It ISN’T lactose-free, but it would be definitely worth a try (unless you are 100% sure that your issue is with lactose, as opposed to uncomfortable after consuming dairy, which could mean the protein is the problem). This looks delicious! Pinning this for later! What a beautiful cake. And it sounds delicious! The colors are amazing. This is beautiful and sounds delicious. Wow the fall fruits make this super unique! As if ‘hot milk’ cake wasn’t unique enough. Oh wow this looks so yummy! I can’t wait to give it a try and have it with a cup of hot chocolate! I haven’t seen that milk before, but I’m going to keep an eye out for it now! I am surprised to see A2 here and happy to hear that Whole Foods carries this. I’ll try it! For some reason I don’t get our emails anymore. I was just visiting.